I’ve taken this idea from Jan Carson (another one to watch), but what I’d like to do is use this little space on the internet to promote awesome people who, I think, deserve recognition (or more recognition). 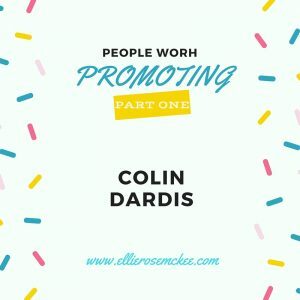 And who better to start with than a man very much at the heart of the Belfast Arts Scene: Colin Dardis? In my own head, I consider Colin to be ‘Poetry NI incarnate‘ – a term he will no doubt appreciate (I hope?). I first met Colin when I, as an inexperienced young thing, entered myself into a poetry slam he was organizing. After pestering him with banal questions about how it all worked, he still let me take the mic. which, secretly, I think was quite brave of him. I was very clueless, and nervous, and boy did it show. But Colin (pretending not to notice) was very nice to treat me like a real performer. Many months after that, he agreed to be my guinea pig, letting me interview him in a trial run for what would become my radio show about the local arts scene. It was even Colin who introduced me to Lulu.com, setting me on my self-publishing journey. Always with his fingers in many pies, Colin really inspires me to get involved with cool projects. If you haven’t already heard of him, please go check him (/his poems) out.